Visitors to the Cathedral have the opportunity to climb the tower so they can experience the 360 degree views which extend up and down the coastline and across the entire city including the bustling harbour. Entrance is by Donation of $10.00 per person, payable at the Cathedral Shop. The tower is CLOSED during church services, concerts and other cathedral events and may be closed in adverse weather conditions. It is not recommended for children younger than 8 to climb the tower. Unaccompanied children are not permitted to climb. This entry was posted in Frontpage, News on April 18, 2018 by admin. The Restoration Walk surrounds the West, South and Eastern sides of the Cathedral. Each brick is valued at $300.00 and represents a very valuable gift to the ongoing maintenance of the cathedral. 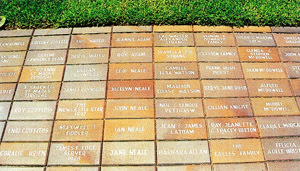 Bricks measure approx 20cm x 12cm and will provide a lasting record of your contribution. For visitors to our city this is your opportunity to assist the Cathedral and be part of our great City and its traditions. This entry was posted in Frontpage, News on November 19, 2017 by admin.